We are glad to inform you that RoboForex obtained a license for an additional MetaTrader 4 trading server. The new server (RoboForex-ECN) will be available for clients with professional ECN accounts. Therefore, on September 18th, all existing ECN accounts were moved to the new MT4 server, which is located close to the servers of liquidity aggregators, Integral and Currenex. A dedicated server should increase the quality of order execution and reduce the risk of system technical failures. In order to get access to your ECN account, you need to download an updated version of the MetaTrader 4 client terminal and install it. 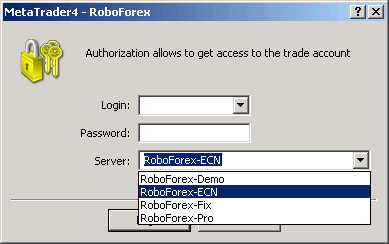 When connecting to your account, use “RoboForex-ECN” trading server as shown in image. In case of any questions or problems, please, contact our Live Support Service immediately.